The Possession is a delightful YA novel. It is the story of two young teenagers, Daphne and Zach, and their destined relationship. It has the perfect combination of ghostly tales mixed with the story of first love, all centered around the tragic history of a forbidden couple that was ripped apart by the town’s racial differences. I was intrigued with The Possession from the title and cover alone, and the story that followed did not disappoint. The first chapter started strong and held my interest up until the very last page. The characters were likable and genuine, and the author paints a beautiful picture of the overall setting. Although I am not an expert in Native American culture or the paranormal, I feel the author did a wonderful job with the details from both aspects. Please note: This book is not suitable for younger readers, as some references are of a sensual and romantic nature. Daphne Wentworth is almost seventeen, definitely a red head, and most likely the tallest girl in her class, which is awkward to say the least when it comes to dating boys in her school. But she doesn’t have to worry about school for the next two months since she’s spending the summer at her aunt Dwill’s lighthouse in Maine. What she does have to worry about is seeing ghosts in the lighthouse cemetery, having strange dreams, and hearing the voices of star-crossed lovers who lived two-hundred years ago. And then there’s a local boy named Zach Philbrook who works for her aunt. He’s too gorgeous for his own good. He’s also very tall, with midnight black hair, and the most beautiful indigo blue eyes Daphne has ever seen. Zach is treated like an outcast by the local teens in town. He’s Micmac and therefore not “one of the gang”. Daphne can’t help being drawn to his strength, especially considering that he’s had to live his entire life dealing with ignorance. But the local teens aren’t the only trouble-makers in town. As Zach and Daphne get closer, the lighthouse ghost lovers begin haunting them. When Daphne and Zach try to figure out how to fight them, the spirits get bolder and more dangerous. So how do you protect yourself from something that isn’t really there? 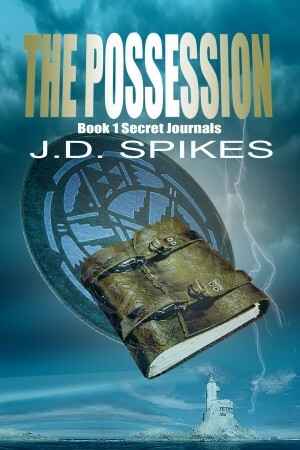 You can purchase a copy of The Possession by J.D. Spikes at Lachesis Publishing at our special 9th anniversary price 50% off!